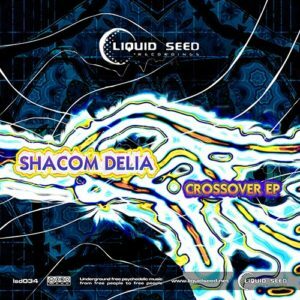 Liquidseed is proud to present their 34th free release, Crossover, a selection of crystal clear full-on psytrance tracks by Greek producer Shacom Delia (Fotis Fourountzidis). Fotis and Liquidseed team met in the middle of winter at a party somewhere in Halkidiki and instantly felt like true family, so the moment Foris asked to release with us made us very proud. He’s already known from releases on well-known psytrance labels such as Goa Records, Stereo Fly, Infinity Tunes, Geomagnetic, and his sound is outstanding, full of inspiration and colorful sounds and effects. Last but not lease he is a true raver! This release is dedicated to Acid Lagos’ new kid, Nikolas. All tracks written produced and mastered by Fotis Fourountzidis. Cover artwork by Angelo Zs, Spirit, and Gaz. With support from Acid Lagos. MP3 Download | FLAC Download | WAV Download · Download count: 7,322. Nice EP release! I like the first and the third track of it! The 2nd is also an interesting journey!